Walmart, IBM, and Chinese retailer JD.com joined forces in December with a Chinese university to form the Blockchain Food Safety Alliance. 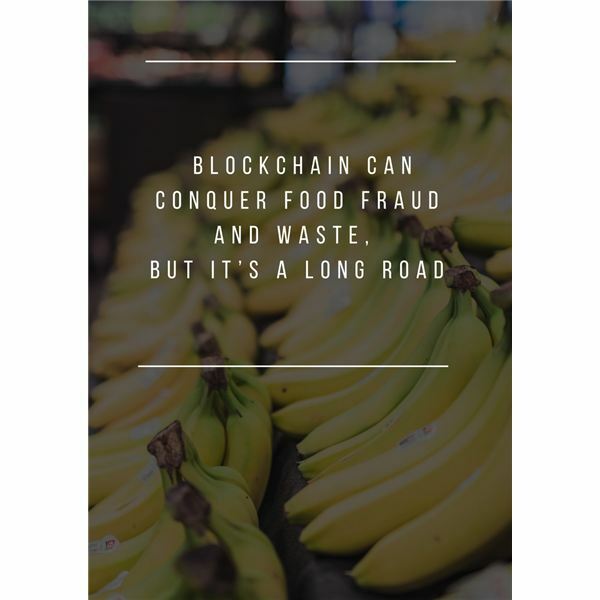 By bringing food supply onto a blockchain platform in which each step in food’s journey can be accurately logged and seen by each supply chain member, the alliance hopes to bring efficiency, accuracy and transparency to the world’s food supply, reducing fraud and foodborne illness. The partnership between a massive tech company and two of the world’s largest food retailers is one of the clearest signs yet that blockchain is ready to scale up, and big corporations are rushing to be on the cutting edge. Food supply is an area rife with potential for blockchain technology. In the past, as food has moved around the world from producers to distributors to retailers, it has been difficult for members of the supply chain to accurately track their products. IBM’s urgency in establishing its blockchain platform in this industry (the December announcement about the Blockchain Food Safety Alliance came only a few months after IBM announced a similar partnership with other producers and distributors) has quickly moved the technology out of the shadows of cryptocurrency and into suburban supermarkets. Blockchain technology offers an innovative way to strengthen transparency while enhancing access to food data for everyone from executives to consumers. It’s a game changer for the food industry and an exciting opportunity for society in general. Everyone benefits from transparency in the food supply chain. Food fraud reportedly affects over 70 percent of our food supply and costs more than $40 billion annually (not including the $55 billion to $93 billion cost associated with foodborne illness). And don’t even get me started on the amount of food we waste. While blockchain seems like the missing link to provide farm-to-table food transparency, it will take a lot of work to implement. Farmers, manufacturers, distributors, and retailers need incentives to provide more food data, and the public demands more insight about the quality of ingredients. A recent study from Label Insight found that 75 percent of consumers don’t trust the accuracy of food labels. Still, 94 percent think it is important that brands are transparent about what is in their food. If you haven’t seen the “Rotten” docuseries on Netflix, it’s a must-watch to see how misleading the food industry can be. Blockchain could standardize food transparency. It would be easy to check whether your meals were truly locally grown, wild-caught, organic, non-GMO, etc. Consumers could simply scan a QR code to see when something was grown or produced. There’s untapped potential in the food industry, and products that can provide an extra layer of transparency will be in demand. Several companies are already working on blockchain services to solve long-standing problems in the food industry. Swiss blockchain startup Ambrosus, for example, uses Ethereum smart contracts to track food quality throughout the supply chain. It’s set to disrupt the food sector while resolving some of the most complex issues facing the market. The company is a proof of concept for startups working to define a new lane in this established industry. Security: Food data needs to be accessible (even public, whenever possible), but it also needs to be secure. When launching Bitcoin, warned of a “51 percent attack” in which the public ledger can be manipulated by convincing more than half of the nodes to agree on a lie. For the blockchain to provide transparency, the information needs to be trustworthy and protected. Walmart teamed up with IBM to find ways to track its meat from farm to table, which could prove particularly useful in combatting foodborne illness. While you push companies to come up with similarly novel ways to use blockchain, spend some time addressing security concerns. Companies that use established security platforms like IBM Blockchain, for example, can rest assured that their data is pristine. Verification: As long as it’s secure, a distributed ledger can help in verifying data accuracy. The balance between transparency and confidentiality is important, however. Nobody wants to disclose trade secrets to possible competitors. To ensure companies adhere to blockchain’s strict verification standards, each transaction will need to be verified by all connected nodes. This consensus mechanism lets consumers know that nobody has tampered with a product’s history, serving as a sort of digital fingerprint. Visualization: Data is only as good as our ability to analyze it. It’s up to companies to provide this information to consumers in an easy-to-digest format. For a steak, for example, consumers should be able to easily obtain an animal’s date of birth, vaccination history, and other important information in a simple interface just by scanning a QR code. To make it clear that they’re embracing this emerging technology, food enterprises could consider something as simple as including a blockchain logo on their products. This seemingly small step helps consumers see that a product has a completely transparent history that they can monitor. Time: The larger a blockchain grows, the longer it takes to verify transaction records. If you withdraw money from an ATM, it reflects in your account balance immediately. Bitcoin transactions, on the other hand, took an average of 43 minutes to verify in 2016 — and that number will only continue to grow. Companies working with blockchain technology — especially those who are working with bitcoin — need to set a reasonable confirmation time for transactions, which will largely depend on how much money is involved. Relatively small exchanges are probably fine with a confirmation period of one or two blocks (each block takes about 10 minutes to be found) but they might want to stick with the industry standard confirmation period of six blocks for larger transactions. Blockchain technology is poised to relieve a lot of pain points in the food supply chain. The challenge will be finding ways to think outside the box, creating new business models that take advantage of blockchain. Instead of working to shoehorn the technology into existing operations, forward-thinking companies must consider ways it can help them offer new services, generate new revenue, and grow. Shireen Yates is co-founder and chief executive officer of Nima, maker of the world’s first portable gluten sensor.